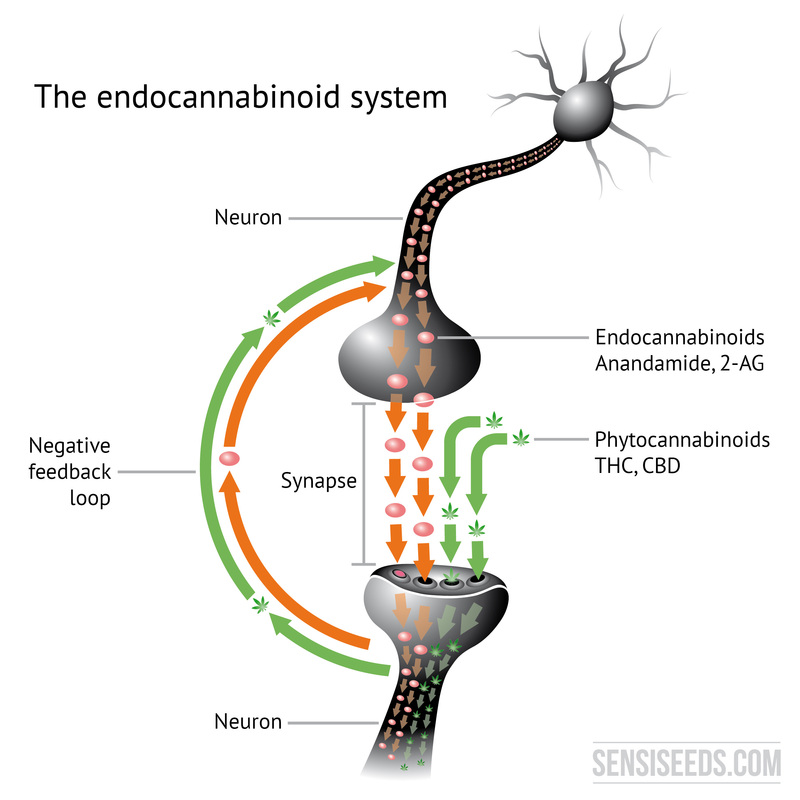 The Endocannabinoid System is made up of neurons, endocannabinoids and cannabinoid receptors. There are nerve cells called neurons throughout the brain and body which are linked together by neurotransmitters. These neurotransmitters are molecules called agonists that move from one neuron to another through the minute space between them, which is called the synapse. The agonists plug into neural receptors, causing a chain reaction. In the case of the Endocannabinoid System, these receptors are called CB1 (Cannabinoid receptor 1) and CB2 (Cannabinoid receptor 2). CB1 receptors are mainly found in the brain, with some in the liver, lungs and kidneys. 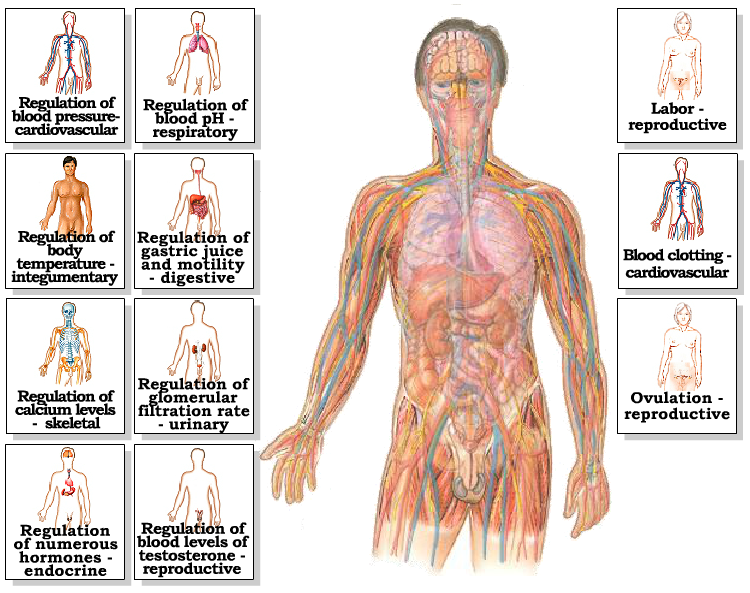 CB2 receptors are found throughout the body. 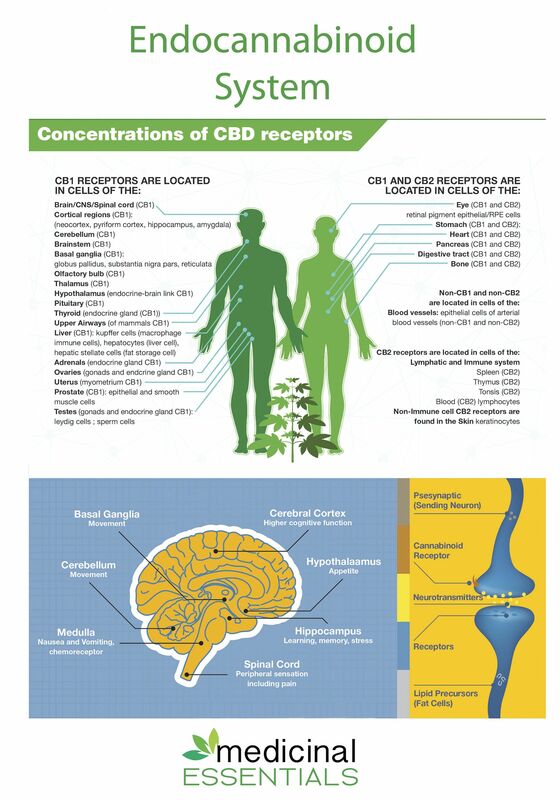 There are more cannabinoid receptors in the brain than any other type of neural receptor and a common analogy is that the agonists are keys and the receptors are locks. The Endocannabinoid System sends signals within the brain and around the body. Cannabinoids transmit signals from one neuron to another. The Endocannabinoid System is activated by cannabinoids. The cannabinoids naturally produced by the body, which are known as endocannabinoids, and cannabinoids found in Cannabis, known as phytocannabinoids. The key and lock analogy is based upon the CB1 and CB2 receptors only being activated by cannabinoids, not any other type of agonist molecule. The cannabinoid ‘keys’ are the only ones that will fit the receptor ‘locks’. CB1 receptors are activated by the phytocannabinoid, tetrahydrocannabinol or THC, so when the ‘head-rush’ effect caused by sativa-dominant, THC-heavy strains is mentioned, there’s a literal quality to that statement! CB2 receptors are activated by the phytocannabinoid cannabidiol or CBD, giving a relaxing, body-centric effect. This makes the location of, and difference between, the two receptors easy to remember! The Endocannabinoid System regulates the body’s systems to maintain homoeostasis: the state of balance necessary for healthy function. Homoeostasis can be thought of as the narrow range of states within which bodies work as they should. For example, blood sugar levels, internal temperature, pH levels of blood, regulation of water and minerals in the body and the removal of metabolic waste are all governed by homoeostatic processes. Most agonists only travel in one direction. Cannabinoids are unusual in that they can travel both ways between neurons. This is known as a negative feedback loop. It is what makes the Endocannabinoid System such an essential system for most lifeforms. It tells the body when to begin a process (for example, sweating to cool down) but also when to stop it (otherwise we’d all be sweating constantly). Bodies constantly make endocannabinoids to interact with their Endocannabinoid System, ensuring homoeostasis continues. If not enough endocannabinoids are created, it is thought Clinical Endocannabinoid Deficiency may occur. It is also thought this can be treated by introducing phytocannabinoids, something humanity has been doing with varying degrees of therapeutic success since before recorded history. the correct functioning of so many different parts and aspects of it. All vertebrates (creatures with a backbone) and invertebrates (creatures without a backbone) have an Endocannabinoid System. This explains why Cannabis products are having such success when used on pets and have the potential to treat a virtually unlimited number of species. There are a few species that don’t have one, such as sea sponges, nematode worms and anemones, since their evolution diverged so long ago. The earliest lifeform known to have cannabinoid receptors is the sea-squirt. This primitive tube-shaped creature evolved more than 600 million years ago and vomits up its internal organs as a self-defence move! There is even a type of slime mould that “possesses a rudimentary endocannabinoid system”. You might think, since the Endocannabinoid System is so ancient, so vital and so common in lifeforms, it would have been discovered long ago. You would be wrong. The Endocannabinoid System was only confirmed in the form that we know it today (CB1 and CB2 receptors, triggered by two known endocannabinoids) in 1995! have been able to get there if we had not looked at the plant”. the tendency towards a relatively stable equilibrium between interdependent elements, especially as maintained by physiological processes. I love this article. May I use it in publication if I site you as the Author? Gidday David, I didn’t author the piece, if you scroll to the end the link from the original is there, I just adapted it. Reblogged this on Dragonfly Tranquility.